Did you ever work out how much of the year you spend sat at your desk or computer workstation? If you’re like me it will be a lot of time; all the more reason to make sure you have the best possible seating – especially if, like me, you have suffered from back problems in the past. When I set up my Gloucestershire copywriting business in 2006, I finally took the plunge and, advised by Nigel Eldridge at The Office Back Care Centre in Cheltenham, invested in some seriously good office seating from Norwegian manufacturer Håg. Several years on, this is proving to be one of my best business investments and a massive productivity aid. 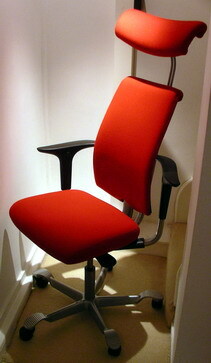 I’d recommend one of these seats to anyone in the creative industries – or any other office environment for that matter. For more information on my experiences with my two ‘Norwegian beauties’, why not visit the office seating article on my website copywriter Resources page. This entry was posted in Uncategorized and tagged back care, copywriter, copywriters, copywriters gloucestershire, ergonomic seating, Gloucestershire, Håg, office seating, seating on November 11, 2010 by alwrites. For the rest of my walk I thought about search engine optimisation. If we wanted to be found by a search and rescue helicopter we’d do all we could to make it easy: using hand signals, smoke flares or objects laid out on the ground. It should be the same with websites. Everyone knows the importance of keywords; but amazingly, as one of my SEO experts was saying just before I left the office, too many clients still don’t appreciate the importance of structuring their website (the hierarchy of pages, the site navigation and the consistent use of search terms) around identified search terms to lead humans and search engines to the content they want. Too often, the site navigation is limited to ‘About Us’, ‘Services’ and similar terms that no one would ever search for. The clever people use a good SEO consultant to structure the site navigation around identified terms that searchers really use – then hire a skilled SEO copywriter to work their magic around ‘helicopter flight training’, ‘haulage contractors Cotswolds’ ‘copywriters in Gloucestershire’ or whatever’s appropriate. It’s rather like standing in a big field, waving your arms at ‘Budgie’ and yelling ‘Come get me!’ We’d all do it if we really wanted to be found! This entry was posted in Uncategorized and tagged 212, bell, copywriters, copywriters gloucestershire, Gloucestershire, haulage contractors cotswolds, helicopter, helicopter flight training, sea king, search engine optimisation, seo, seo copywriter, site navigation, website on November 3, 2010 by alwrites. It’s nearly two weeks since the announcement of the long-awaited comprehensive spending review (CSR). Up on the hill behind the village, little has changed except for the browning autumn leaves. And in boardrooms around the country, the lines are drawn between cautious optimists and those who see impending economic doom. Whether CSR proves to be the key to economic recovery or the trigger for the dreaded double-dip recession, the case for better copywriting is clear. Back in the 1980s we were all advised to advertise through recession. We were told that brands that invested through the hard times would emerge stronger at the other end. This time around, online presence is the one thing that no business can afford to neglect. Is your website looking tired or underperforming in Google? Now’s the perfect time to invest in a makeover. Never got beyond a first generation site? How about going to the next level? Either way, words can work for you. Whatever you decide to do, investing in better copy puts the perfect face on your web presence and complements the underlying design and SEO work. Poor copy is a surefire way to put-off human visitors (your potential customers) and the search engines alike. Good copy, on the other hand, is a great way to engage prospects and bots effectively. Whether the CSR cloud reveals a silver lining or we dive deeper into recession, even a modest investment in those words has to be a good thing. If things get better you’re perfectly positioned to outgun your competition; if they worsen, to compete harder for business. Either way, from simple copy-editing of existing content to a wholesale copy revamp, words from one of the Gloucestershire copywriters could be working harder for you. This entry was posted in Uncategorized and tagged autumn, copywriters, copywriters gloucestershire, copywriting, csr, economic, Gloucestershire, recession, recovery, spending review on November 2, 2010 by alwrites. I received an anonymous hate email a few months ago; it hadn’t happened before and it hasn’t happened since. And despite coming from someone in the copywriting world, it wasn’t that well written either. I quickly forgot about it and got on with being a Gloucestershire copywriter. So why, all these months later, has this incident resurfaced to prompt a cathartic blog entry? But why waste my time on someone who isn’t prepared to put their name behind their writing? In the past I’ve received constructive comments from other copywriters; I’ve offered advice too. It’s all part of being a good online citizen. What really set me thinking about that email again were some recent comments and testimonials from clients that (as well as confirming that I can write) endorsed my integrity and openness, and the way they always know what they’re getting from me. I also have the confidence and courage to stand behind what I say instead of hiding behind a veil of anonymity. You may agree or disagree with my ideas; we can talk about it and I’ll even concede a well-argued point. Then I’ll get on with the writing that promotes your organisation, do a great job and put my name to it with pride. That’s the real difference between me and the anonymous emailer. This entry was posted in Uncategorized and tagged copywriter, copywriters gloucestershire, email, Gloucestershire on November 1, 2010 by alwrites.